The official English Cardfight!! Vanguard portal has been updated with deck recipe spaces for every branch of this year's world championship, and with this update has come the decklists from the weekend's WCS2013 Toronto qualifier. The qualifier's results came as a surprise following a format that had been dominated largely by Dragonic Overlord the End, as regional champion Sebastian LeBon won the tournament using a Nova Grappler deck based around Illuminal Dragon, while runner-up Kevin Perron took his position with a Narukami deck built on Dragonic Kaiser Vermillion and his crossride "THE BLOOD." Note that while only the top 2 decklists from Toronto are being provided, the top 4 finishers from the regional have been invited to the North American finals. The decks not represented in the deck recipes are Robert Ewell's Tri-stinger Dragon and Kevin Luu's Majesty Lord Blaster deck. One of the differentiating features of LeBon's Illuminal deck is the use of Scarlet Bird. Many Beast Deity builds avoid the card now due to its low 6000 base that doesn't play well with a format dominated by 13000 power defense, but LeBon's deck plays toward making offensive moves throughout the entire length of a match rather than just after limit break, and Scarlet Bird's skill gives him one more way to search out one of the pieces of his main strategy without any need for counterblast. Although units like Blank Marsh and White Tiger aren't well suited to the endgame of the crossride format due to no single unit being able to break 13000 unboosted, many cardfighters have difficulty dealing with the earlier offensive plays and this helps feed to an endgame where Illuminal stands one full column after the opponent has hit 5 damage, letting it use every line to attack the opponent previously and still leave one standing to pass triggers onto. Attacking early and hard is a very simple strategy, but trying to oppose it oftentimes means surrendering the lead in card advantage for the duration of an entire game, and making that compromise can be a very risky play. x4 Dragonic Kaiser Vermillion "THE BLOOD"
Meanwhile Perron's Kaiser Vermillion stands out for its grade 2 lineup, focusing toward Thunderstorm and Dusty Plasma, both cards that assist in making those 18000 lines to negate crossride defense and in other cases make unboosted swings. 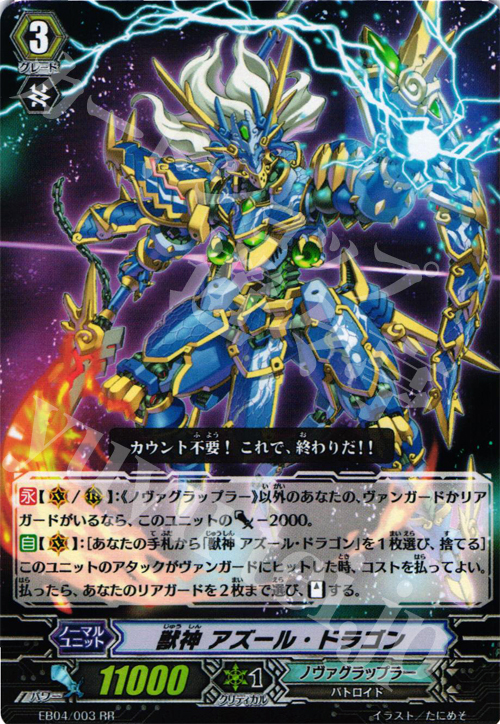 Unlike contemporary DKV decks which frequently feature Deathscythe as a 4-card staple of the build, Perron chose to put Deathscythe on the backburner, entrusting field control to Vermillion. His treatment of Garuda is also an interesting choice. 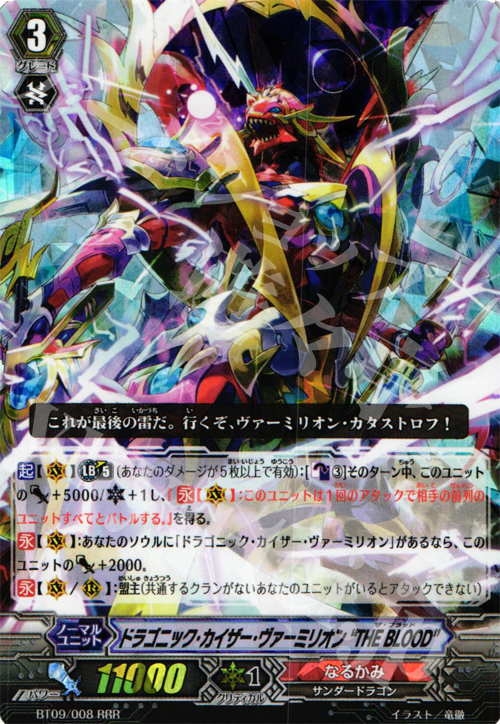 Many DKV decks run Garuda at 3 or 4 copies, but by focusing less on Deathscythe, Perron opened up his damage zone considerably so that he would not need a heavy focus on unflipping to use his Vermillions' skills multiple times. Of his grade 1 lineup, Rising Phoenix is arguably the most important supporting framework from the deck, since it can make up for Spark Kid Dragoon's skill failing or otherwise make use of the soul for a normal +1 that helps stretch out a difference in cards between Perron and his opponent when factoring in the -2~4 incurred to them by his limit breaks while providing improved consistency through raw draw power. Our hats are off to Mr. LeBon and Mr. Perron for a lively opening to this year's world tournament. Bushiroad has also released a full breakdown of clan representation within the tournament. Kagerou and Gold Paladin were the most popular clans, followed by Bermuda Triangle, Narukami and Oracle Think Tank, with Royal Paladin as the sixth most played. These numbers are fairly normal, and can be taken to generally correspond to the six key units of the format DOTE, Platina Ezel, Labrador, "THE BLOOD," Tsukuyomi and Majesty Lord Blaster. Below is the full table of 19 clans reproduced in text, and numbered according to the order of Bushiroad's info graphic, which is based on how highly used each clan was. The only clan complete in the English format but not represented at Toronto are the Dark Irregulars, with every other available clan finding some representation.